You have got to be kidding me, right? This gets crazier, though, because now you can add Chris Cooley to your iPhone. This is crazy-talk. 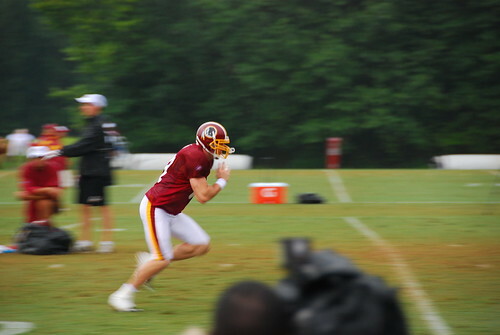 Chris Cooley doesn’t need to be building iPhone apps in the off-season, he needs to be working on catching the football and increasing his speed. But, hey, if you’ve got an iPhone app, I suppose that makes dropping the ball okay. There’s still more news about the Redskins talks with the city to consider a new stadium on the site of RFK. East DC could again play host to the Skins if they can figure out how to pay for the new stadium (Memo to Dan Snyder: You’re buying.) and training facility, as well as break the lease (currently through 2027) at Fedex Field. We’ll see how that goes. It would not likely be complete at any point before 2013 at the earliest. The Redskins play Saturday night at home against Super Bowl Champion Pittsburgh, and then the following Friday against the New England Patriots. The first season of the WPS league is done for the Freedom, as they fell to New Jersey’s Sky Blue FC in a 2-1 match at the Soccerplex on Saturday afternoon. It was win-or-go-home for the Freedom, and unfortunately they’ll be going home. 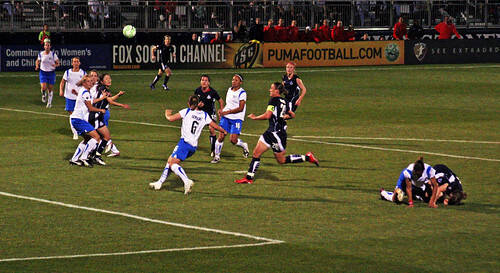 Abby Wambach was shut down by Sky Blue, putting a cap on the potential offense for DC, and it was Lisa De Vanna’s turn to put one in the Net. Sadly, a goal from Sky Blue’s Francielle in the 84th minute would be the difference in the game. A lackluster loss to Toronto FC on Saturday put the United back on the Skids in the MLS. United just hasn’t been able to deliver on the road, and Saturday’s match in Toronto was no exception, getting shutout 2-0. United could only manage 5 shots on goal, a pretty thorough thrashing. Tuesday, United takes on C.D Marathón on the road as part of CONCACAF Play, and then Beckham and the LA Galaxy are in town for an MLS matchup. You can get tickets to both the Galaxy match and the US Open Cup Finals against the Seattle Sounders for just $45 right now, which is a nice deal. Get out and see if we can’t get United back in the swing of things. Before we get to the Strasburg news, let’s talk about the robots from the future that have kidnapped and replaced the Washington Nationals. In the last two weeks, the Nats are 10-3, and that goes up to 17-10 over the last four weeks. Who are these guys, and why have they only just now started to play? Excepting the two-game series with Atlanta, the last time the Nats lost a series was mid-July against the Cubs. Since then, the Nats have won or tied every series with the exception of the 2-gamer in Atlanta. Lead by an offense that’s hitting the ball, and a pitching staff that’s stayed into the game, the Nats are playing with something they haven’t been able to find all season: Heart. They actually seem to mean it out there, and that’ll help significantly. The Nats have a much needed and deserved off day today, but are in town all week, playing 3 against Colorado and 4 against Milwaukee. Tickets shouldn’t be a problem, so head on out and cheer on our robot men from the future! Scenario 1: Strasburg tells Boras to sign at 11:59pm, and they manage to wheedle $20M + incentives for $5M more out of the Lerner family. 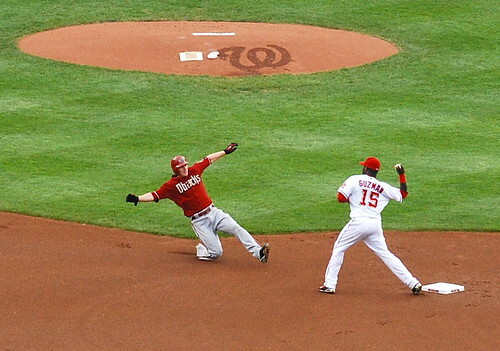 There’s much hand-wringing from the press, the fans are excited by the prospect of having someone as talented as Ryan Zimmerman on the mound for the Nats by the middle of next season. There’s some discontent with Boras, as usual, but the eventual result is nothing. Scenario 2: There’s no signature at 11:59, and as a result, there’s hew and cry from the fans as the Nats pass on one of the best pitching prospects in major league history. The Lerners and Mike Rizzo come up with excuses, Scott Boras cries some crocodile tears in the media, and Strasburg signs with a Japanese team for a one year contract worth about what the Nats would’ve paid. No telling what happens next. Things were looking up a bit for the Mystics until last night’s dreadful offense-less loss to cellar-dweller New York. They’d take a double overtime game against Connecticut, and Alana Beard’s been averaging closer and closer to 20 points a game. The Mystics head out on the road for four games against the Western Conference and a chance to prove themselves worthy of playoff action, before coming home for two games at the end of the month. The Mystics are going to have to do much better than .500 ball if they want to make the playoffs and this road trip will be the test. They should walk all over Sacramento and Los Angeles; they’ll need to bring their A game for Seattle or Phoenix, and a win against one of those two is an absolute must.